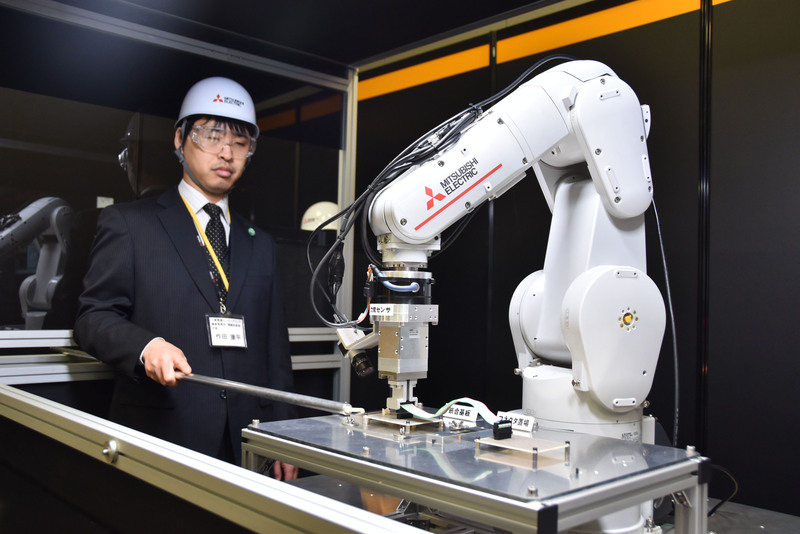 A Mitsubishi Electric Corp. engineer operates a robotic arm during a research and development open house event in Tokyo on Wednesday. 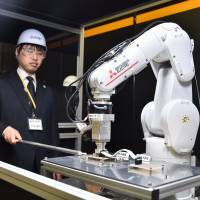 | MITSUBISHI ELECTRIC CORP.
Mitsubishi Electric Corp. launched a research and development open house event in Tokyo this week to showcase their latest advanced research products. The main focus of the event was the company’s new array of AI technology. The firm spent a record ¥212 billion on research and development in 2017. With research centers in Japan, China, the U.S. and Europe, and a growing number of open innovation ties with universities and research organizations both inside and outside of Japan, the company appears poised to maintain its large research and development budget well into the future. Worldwide spending on AI systems totaled $12 billion last year, 59 percent more than in 2016. In Japan the amount spent on the field is being boosted under the Fifth Science and Technology Basic Plan, a ¥26 trillion government-backed investment in AI research that runs from 2016 to 2020. Mitsubishi Electric is applying artificial intelligence technologies to a wide range of businesses through its AI brand “Maisart.” These include AI technology used in intelligent industrial robots, automated analysis of images from security cameras, and simultaneous speech using only one microphone. “We are able to combine our knowledge of hardware with components of AI technology to produce the best products — that’s our strength,” Masahiro Fujita, executive officer of the company, told the event Wednesday. While Mitsubishi has long maintained a substantial research budget, the government has set lofty goals for AI research in recent years. According to a report published by the Cabinet Office’s Advisory Board on Artificial Intelligence and Human Society, AI technologies are critical and fundamental for Japanese society to fix social problems such as the dire labor shortage. Japan is also boosting the use of AI ahead of the 2020 Tokyo Olympic Games for scoring certain Olympic sports, public service robots, and predictive policing — a method of anticipating crime and accidents. Besides artificial intelligence, Mitsubishi Electric’s R&D also covers technology related to smart mobility and advanced living as well as safe and secure infrastructure, automated vehicle navigation systems, networked smart appliances at home, and the world’s first 5G base stations. electronics, R&D, AI, Mitsubishi Electric Corp.